‘Nelson and Minerve at Gibraltar, 1796’, Further Reading. – Special orders from the C. in C., a voyage by order of Admiral Sir John Jervis, for a special assignment. The frigate Minerve voyage lead directly to Nelson and his commander, admiral Sir John Jervis becoming famous International celebrities, a knighthood and appointment as Rear Admiral for Nelson. One of The [my] Nelson and Trafalgar Series. This painting 46 x 91 cm (18″ x 36″), oils on canvas, available, is presented in a handmade medium antique swept style gold frame. Nelson wrote to his wife “that this was a special assignment”, “most important”. He added, “it is not a fighting mission, so therefore be not uneasy”. The assurance was doubtless honestly given but, scarcely to be implicitly accepted in view of his career, as events soon after confirmed. The frigate Minerve was commanded by the renowned Captain George Cockburn (appointed August 1796) so when Admiral John Jervis sent Nelson as Commodore to the frigates Minerve and Blanche we might expect some thing to happen. If this interests you don’t miss Less know facts about Horatio Nelson and more about the ships in my text below, enjoy. Uniquely in the history of HMS Victory, Gordon Frickers was commissioned (1994 to 1998) to work for HMS Victory. One of the very few artists and the first and only marine artist to be invited to exhibit at the European Parliament, Brussels (May 2011). This moment shown here was the portal to Nelson’s rise to fame. The climax of which was the battle of Cape St Vincent which by a brilliant manoeuvre Nelson enabled his commander Admiral Sir John Jervis to win. Nelson’s contribution included discovering in thick fog, the Spanish fleet while returning with Minerve and once back aboard HMS Captain, with his crew, in the most gallant manner, capturing of two Spanish line of battle ships. The latter achievement came to be described by men of the fleet as “Nelson’s patent boarding bridge”. This painting shows 2 of the ships in which Nelson served, HMS Minerve and HMS Captain on the 10th of December 1796. Nelson’s voyage in the frigate Minerve gives us clues to Nelson’s qualities, a character that has made him immortal. Here Nelson is shown in the stern sheets of a cutter with tossed oars. He is transferring from the 74 gun ship of the line of battle HMS Captain at Gibraltar, 10th December 1796 to the frigate Minerve . Thus You have 2 Nelson ships in this painting for the price of one. This painting, one of my unrepeatable “Nelson and Trafalgar Collection” is available. Often remarked upon, the exquisite carved decorations are picked out in real gold paint in the painting. One that hangs comfortably with the finest collections. Surprisingly of the hundreds of books on Nelson most don’t mention this stirring, significant tale, The Minerve voyage. The research for this marine painting showed this moment lead Nelson’s course to the battle of Cape St Vincent. For a sketch initially I had in mind the French explorer “Laperouse arriving at Botany Bay” where he found the First Fleet. Later I realised this sketch would not fit that story, the timing was wrong. However I thought later, the idea could be adapted for “Nelson at Gibraltar“. Coincidentally at about the same time, the renowned author Peter Goodwin and I discovered new information on a specialised matter that had interested and puzzled us for over a decade. Exactly which colours Nelson’s ships including HMS Victory were painted. We knew Nelson’s captains all adopted the same colour scheme. You may recall, at that period, how ships were painted was left to the discretion of the commanders? Nelson chose what people called at that time ‘bright yellow’ because he said, it looked more war like. Keep in mind, chrome yellow was very expensive and not generally available until 1820. Another of my heroes, J M W Turner being one of the first artists to use the colour as made by Winsor and Newton, a company which still trades and who’s very excellent colours I predominantly use today. The date and Peter Goodwin will confirm when this was painted by me, partly created to show for the first time the exact colour that was “Nelson’s Bright Yellow”. The ships and flags are of course as spot on as is possible. The ships appearances are taken from Admiralty drafts, the stern gallery of the Minerve being as near correct as is possible for me to make it. Minerve is shown with all sail harbour stowed except the Spanker which is set to steady her head to wind while she receives Commodore Nelson. You may notice a lot of men are shown? All are shown at appropriate tasks including on the distant HMS Captain and of course, their clothing, hats, hair cuts are to the period. A neat touch, have you noticed the exquisite carved decorations are picked out with real gold paint ? Upon enquiry, I was invited to visit Her Majesty’s United Kingdom Hydrographic Office [HMHO], a secure building where the world renowned ‘Admiralty Charts’, traditional and these days digital charts are made, also available as online versions. HMHO is a secure complex, armed soldiers, passes with your photograph, definitely not open to the public. To achieve the ‘port of Gibraltar’ which you can easily guess is much changed sine the 18 th century. 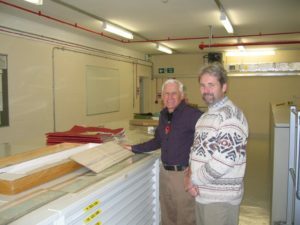 I duly visited the government building Her Majesties Hydrographic Office at Taunton, Somerset, to view a number of artefacts for several paintings, at. For Gibraltar we found period water colours made by Royal Navy officers, showing the port, and charts showing where ships moored. I wished to know approximately how the town and Docks appeared in 1796 and where in the bay Britannic Royal Navy ships would anchor. Both questions were successfully answered at the UKHO. I was able to visit as recorded in my blog entry, 6 November 2009. I considered myself fortunate to be allowed past the gates and signed in. I was helped enormously and willingly, shown everything I could wish to see and treated as an honoured guest, being introduced to senior staff. HMHO is most famous for producing the Admiralty series of charts, a process that is on going today. These days the UKHO still handles daily the latest undersea surveys and produces state of the art GPS driven digital charts to complement their hard copies. No charts other are more reliable. What is not so well known is HMHO has records not available to the public, that go back at least as far as the early 17 th century. I was most fortunate to be invited for a day and to my great surprise, treated like royalty. The staff could not have been kinder, more enthusiastic or more helpful. My visit proved to be a day of surprises. My day there included seeing original water colours, never exhibited, rarely out of their box known as ‘The Coffin’. You must shown him “The Coffin” I kept hearing. The Coffin turned out to be a varnished oak box that looked like new. It contained THE complete collection of watercolours, each about 4 feet long, each of a section that added up to be the entire French coast, painted from Royal Navy ships by Serres who was Official Marine Artist to the King. The skill and detail shown was stunning. 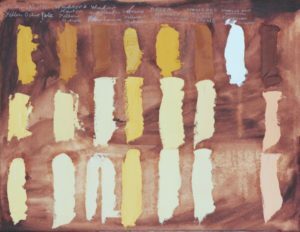 This confirmed beyond any doubts, among other things the results Peter Goodwin and I achieved by my experimenting with a variety of makes of colour, when we discovered the true appearance of ‘Nelson’s Bright Yellow’ [the subject of another painting in this series]. My grateful thanks go to the good people at Her Majesties Hydrographic Office, Taunton, Somerset. The frigate Minerve started life in France, known in French service as LA MINERVE she was laid down at Toulon in 1793. Taken as a prize into the British Royal Navy she was known simply as Minerve. I’ve written in greater detail about the Minerve and the other ships illustrated here in this work in my text below. There is an incident during the voyage with Minerve, ‘borrowed’ by the most famous of naval author’s C S Forester for his character Horatio Hornblower, in “Hornblower and the Atropos“. A copy of a book by C S Forester, ‘Midshipman Hornblower’ was given to a bored 13 year old Gordon Frickers by his Father. He said to me, “I enjoyed this. Tell me later what you think of it“. That book was the spark that fired my interest in marine history. My eternal thanks to my Dad and Mr. Forester for the portal, this enriching of my life. HMS Minerve was the beginning of the voyage that consolidated Nelson‘s name and first made him truly famous, yet many of the books on Nelson don’t mention Nelson’s crucial time on the frigate Minerve. This painting started life as a sketch I made one evening while quietly quaffing a therapeutic beer in what was in those days a frequent watering hole of mine, the members lounge of the Royal Plymouth Corinthian Yacht Club. Nelson & Minerve, sketch, available, £100.. The RPCYC has to this day, in it’s member’s lounge in pride of place two fine paintings by my hand, commissioned by the committee when lead by the Commodore, Captain Paul Willerton, “Spring Series” and “Armada 400“; another reason I felt comfortable there. Those RPCYC paintings were intended to show future generations how things were then, 1991; which they now do most successfully. At the time of writing this painting featuring Nelson has been exhibited only once. That was at the solo exhibition “Life on the Ocean Wave” were by invitation I became one of the very few artists and the first marine artist to show at the European Parliament (May 2011). Nelson at Gibraltar is at the time of writing available offers around £12,000 considered. This painting, this story, fits well the original brief given me when I started work for HMS Victory back in 1994. The original series of paintings inspired by the late Nick Varley and sponsored by Victory 2005 Ltd were intended to help raise funds to support the restoration of HMS Victory and provide the Royal Naval Museum with products to generate further interest and importantly, income. Those originals are property of Victory 2005 Ltd, currently stored on a London bank vault and we are told the directors are interested in selling their collection. The Minerve painting is thus a natural continuation of an extraordinary series, the brief was “Nelson, Victory, Trafalgar, the less known but interesting aspects”. 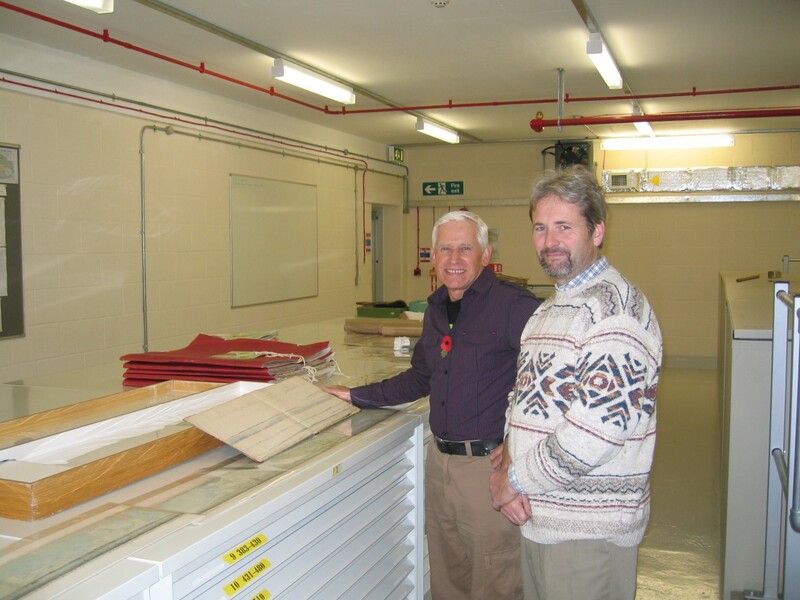 Additionally the project was to support the work of Peter Goodwin then keeper and Curator of HMS Victory and the work of the Society of Nautical Research. Peter Goodwin, a legend in his own lifetime, generously said my work opened his eyes to the possibilities of painting. Meaning I was able to contribute a lot more than just my paintings to his ideas and work. Adventures aside, during his mission to Elba, Nelson, not quite a perfect hero, clearly displayed many of his finest and most admirable qualities. By November 1796 Nelson had parted company with his beloved Agamemnon (67 guns, launched 1781 by Henry Adams at Buckler’s Hard). The Agamemnon was sent home, rotten, worn out and although Admiral John Jervis, a man quick to appreciate both Nelson’s genius and shortcomings offered Nelson the St George (90 guns) or the Zealous (74 guns) Nelson transferred with some of his key officers to HMS Captain commanded by Captain R.W. Miller. HMS Captain had been in Gibraltar for 10 days when Nelson was ordered by Admiral John Jervis to leave HMS Captain, to board the frigate Minerve and set sail on a special mission, 15th of December 1796. When Sir John Jervis put Minerve, the fastest and most powerful frigate in the Mediterranean in the hands of Captain Cockburn and then sent Nelson to Minerve, the C in C had created a crack ship. I have added quite a bit more on this subject and it’s outcome towards the end of this text. As mentioned, we found this part of the Nelson story is barely mentioned and not at all in many of the books about Nelson. One of the few books to cover this event is “The Life of Nelson” by the American author Captain A T Mahon, Publisher: Sampson Low, Marston, London, Publication Date: 1899. One can sometimes if lucky obtain a copy on the Internet for around £35, or from a good second hand marine book seller as did I. Give the commission by Victory 2005 Ltd and as ‘Official Artist’ to HMS Victory, something needed to be done, still does. For Gibraltar Bay the staff at the HM UK Hydrographic office were extraordinarily generous with their support. The UKHO charts and the collection go back some 275 years. The charts and pictures record much of the primitive world that evolved into the complex world we know today and some remarkable treasures include maps which were being restored when I visited the UKHO from the American War of Independence showing positions of forces around New York. During my visit I found myself looking at an original Chart of Botany Bay (for a “Laperouse” painting) drawn by Captain James Cook and thinking, ‘how many souls were drawn to Australia as a result of that chart’; awesome or what? Incidentally more recently (14 May 2012) I was speaking with a serving Royal Navy officer who had been assigned to updating some of James Cooks charts. Sincere thanks to the UKHO Staff for the correct Gibraltar anchorage markers (Admiralty drafts) and access to study various pilot’s sketches of Gibraltar town for period 1796 thus giving an additional authority helping make this Painting “Nelson at Gibraltar” special. This unusual composition was chosen partly to give us a close look at HMS Minerve, and partly to achieve maximum depth because we wanted to test a colour and light theory. A few comments follow on the details of this painting, more on Colour scheme of ships appears else where on www.frickers.co.uk/blog with my painting (available) under the title ‘Nelson’s Bright Yellow’. Through out this ‘Minerve’ painting there are people actively employed. The Minerve crew is ‘present’; they are preparing to welcome Commodore Nelson on board. 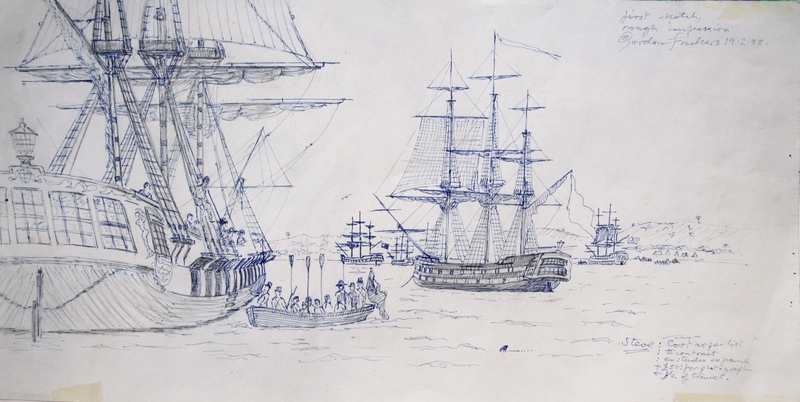 Where Nelson is to board, note the cutter hooking on to Minerve, the frigate has a mid-ship bend, a pronounced roundness, called a tumble home, which was a characteristic of J.-M.-B. Coulomb’s (French) design style. The stern of Minerve repays a closer look. The stern is not of the standard horse shoe shape, leading to the question whether or not it is original. This is in part explained by the absence of any quarterdeck cabin or half poop on this frigate. There are unusual two elliptical stem chase ports in the taffrail. It was a source of much trouble while under British ownership possibly due to poor quality wood when originally built. After 1795 the ship’s log of Minerve shows frequent repairs made to her stern. You may also notice the exquisite carved decorations picked out in real gold in the painting. Background details include the frigate Blanche ‘coming out’, a 74 gun ship with topmasts down and numerous other fine details, even a ships cat on Minerve’s stern. These types of small merchant ship were formerly a common sight in Mediterranean ports and on the seaboard, sometimes used as pirate ships. C.S. Forester in his Horatio Hornblower series of books mentions his principal character when in the Med stopping and searching xebecs and tartans. Thanks to D. and J.T. Serres both official marine painters to the crown. I have a copy of their the very rare book ‘Liber Nauticus’ thus we have an example of each vessel in this painting. I’ve written more about the composition of this work in my text below. Cats and other animals feature in a number of my paintings. Cats have an ability to adapt to new surroundings, if not overly petted can be useful so were therefore highly suitable for service on a ship. Cats also offered companionship and a sense of home and security to sailors who could be away from home for long periods, especially in times of war. Many authorities have noted, the ‘British Tar’, so ferocious and feared in battle was invariably tender and protective of animals. 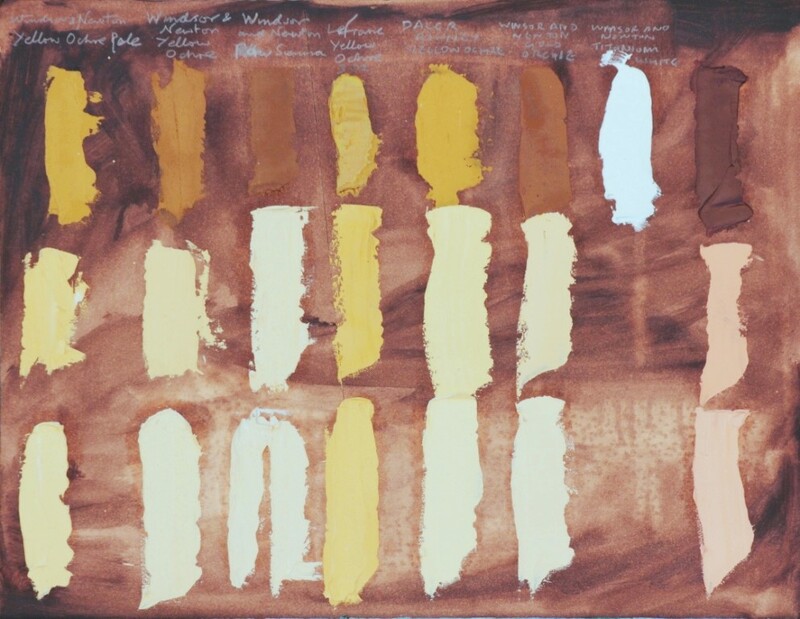 This painting was used to test a theory of the modified appearance at varying distances of ‘Nelson’s Bright Yellow’. Our discoveries about the true appearance of Nelsonian ships are outlined in the text about the painting ‘Nelson’s Bright Yellow’ on this website. By seeing ships at varying distances and different angles to the light source we can better appreciate how the bright yellow and other colours would be modified by light, distance and atmosphere. At this period ships were generally painted black with a tar like substance or if new, varnished. Older ships as the varnish degenerated invariably turned to black. Even rancid butter was some times used as a preservative on rigging! Black was a relative term, the paint material and standing rigging often weathering to shades of reddish brown or grey which would appear at a distance, black. There were of course by ancient tradition other colours and decoration used on ships. Much depended on the commander’ attitude and the depth of his pocket. Nelson was never a rich man but liked his ships to look ‘warlike’. Minerve – was a 38 gun French built frigate, the fastest and most powerful frigate in the Mediterranean. She was commanded by the renowned Captain George Cockburn (appointed August 1796) so when Jervis sent Nelson to Minerve we might expect some thing to happen. It is perhaps surprising so many authors missed the resultant story and another good reason for this painting. HMS Minerve (GB) – LA MINERVE (Fr.) designed by J.-M.-B. Coulomb, she was a 38 gun frigate built at Toulon in 1793. She was cap­tured and taken into the Royal Navy as H.M.S. Minerve in 1795, she was recaptured by the French in 1803; as La Confiance she was captured yet again by the Royal Navy in 1810! Minerve was a name of dubious luck not only for the French Navy who lost some ten vessels of that name (and one Minerva), captured by the Royal Navy for the British and also lost a Minerve Portuguese. The ‘exchanges’ were not entirely one way, two English and one Portuguese Minerva were captured by the French. HMS Captain – The 74 gun HMS Captain appears in the centre of this painting. She was of the Canada Class, built at Limehouse, London launched 1787. She is shown as per the period, most noticeably in a period colour scheme pre the more familiar double yellow stripes on her hull. HMS Captain was the ship Nelson used so brilliantly at the battle of Cape St Vincent. Nelson boarding the frigate Minerve at Gibraltar; In 1796 Nelson, always an ambitious man with a sense of destiny hoped he might soon achieve the honours he keenly sought. At that time it was not Nelson dazzling Europe. The name on the majority of lips was that of a young French officer of artillery from Corsica, Napoleon Bonaparte. HMS Captain had been in Gibraltar for 10 days when Nelson left HMS Captain to board Minerve and set sail on a special mission, 15th of December 1796. Nelson in 1796 by then a commodore. He was ordered by John Jervis to supervise the British withdrawal from the Med which Nelson described in a letter to his wife Fanny as “most important” but “it is not a fighting mission, therefore be not uneasy”. After years of frustration and the French Revolutionary war going against Britain. In late November 1796 the British Mediterranean fleet including Nelson came under the command of Admiral Sir John Jervis. Not all the officers of the fleet were as pleased as Nelson to see the arrival of Sir John Jervis. Jervis was a strict disciplinarian, did not always have an “unruffled command of his temper”. With a some times grim sense of humour John Jervis if he felt provoked could unleash “a torrent of impetuous reproof in unmeasured language”. John Jervis did not suffer those he thought fools. On the other hand he generally gave prompt and ungrudging acknowledgement to zeal, skill and gallantry and was privately kind and generous. Leaving Gibraltar Minerve in company with the frigate HMS Blanche, the 2 British frigates at 11.00 p.m. on the 19th of December off Cartagena encountered 2 large frigates suspected as enemies. A fierce 3 hour night action against the 2 Spanish frigates immediately followed. The Spaniard fought very bravely, lost 164 men including all her officers except her captain. The commander of Minerve’s opponent (La Sabina) much to Nelson’s pleasure (he admired all royalty) turned out to be Don Jacoba Stuart a descendant of The Duke of Berwick. Soon after the close of action another Spanish frigate was brought to action but hauled off after half an hour; to be reinforced by 2 more frigates and two ships of the line, all attracted by the sound of gunfire. There was no lack of fight in those Spaniards. The 2 prizes had to be abandoned because of the considerably superior Spanish force and damage done to the British frigates. Among the abandoned prize crews was one Lt Thomas Masterman Hardy. The damaged British frigates very narrowly escaped capture. When Blanche and Minerve eventually re united Nelson showed qualities very remarkable even by today’s standards. Nelson spontaneously boarded Blanche and personally thanked each member of her crew for their efforts. Nelson knew the crew of Blanche had recently refused a captain and almost mutinied. Nelson intuitively knew how to win hearts and minds. Nelson completed the rest of his delicate mission to evacuate the Navy from the Mediterranean, with tact, diplomacy and speed, despite problems with the army commander. He then tried to locate the Spanish fleet by risking making a round of Spanish ports. On returning to Gibraltar he learned a large force of Spanish ships of the line had just sailing west past Gibraltar. Nelson in Minerve was not sure if the Spanish fleet were going to head North or West. Nelson saw the significance immediately so contrary to orders, ever willing to take calculated risks, he abandoned his post for which he could have been ruined, Court Marshalled, in an effort to locate the Spanish fleet. He decided to sail west and if needed to warn the British in the Caribbean or north to join John Jervis’ fleet on watch off Cadiz. This initiative risked his career. He pursued; and in turn was pursued by 2 large Spanish war ships one of which almost caught Minerve. By then Lt. Hardy had been exchanged and re joined Minerve. As Minerve fled before two powerful enemy ships of the line, either of which easily outclassed, outgunned the frigate Minerve, a man fell overboard. Lt Hardy in unhesitatingly going after a man overboard, was left behind, a much more powerful Spaniard being almost within gunshot. Nelson exclaimed “by God I’ll not loose Hardy a second time” and at great risk to Minerve backed the mizzen topsail, stopped to recover his people. Fortunately for Minerve this manoeuvre confused and disconcerted the leading Spaniard. She probably fearing her prey had sighted a British squadron, she stopped to let her consort catch up and thereby lost the slippery Minerve. Nelson did not lose Hardy. Partly by luck, partly good judgement and in fog Minerve found the Spanish fleet by accidentally sailing into their fleet. Skilfully escaping undetected, the next day Nelson found the British fleet and reported to Admiral Jervis. Commodore Nelson transferred back into the 74 gun ship of the line HMS Captain (shown in the painting) in which he was serving prior to the transfer to frigate Minerve. A battle followed off Cape St Vincent 14th February 1797 where again Nelson brilliantly broke with conventions. The engagement won Jervis an Earldom, made Nelson’s name and reputation and after which Nelson was created a knight of the Bath and made up to Rear Admiral. Probably more has been written about Horatio Nelson than any other single sea commander. Gordon Frickers copy is dated 1993. ‘Nelson’s Ships’ by Peter Goodwin, ISBN 0-85177-742-2. Gordon Frickers copy is dated 2002. Robert Southey, born 1784, made Poet Laureate in 1813; many agree he wrote the first sound account of the life of Nelson and the public perception of Nelson is still under its influence. Southey was a friend of Coleridge, Sir Walter Scott and regular contributor to leading journals of the period. ‘The Life of Nelson’ by R. Southey was first published in July 1813. “I am such a lubber” admitted Southey, to his eternal credit he was advised on nautical matters by his brother Captain Robert Southey who read the proofs, he accepted reasonable criticism, earnestly corrected faults and the results appeared in the outstanding 1830 revised edition. Even Princess Victoria told Southey she had read his Life of Nelson “with great pleasure”. The very favourable reaction of Americans to ‘The Life of Nelson’, published during the war of 1812, is particularly curious. Gordon Frickers copy is dated 1990. The Life of Nelson” by Captain Alfred T. Mahan USN first published 1897, is generally regarded as the other classic biography. Try Chapter VII for the Elba mission. Gordon Frickers copy is dated 1899. ‘Liber Nauticus’ by D. and J.T. Serres, first published 1805, Gordon Frickers copy is dated 1973. ‘The Pursuit of Victory – The Life and Achievements of Horatio Nelson’ by Roger Knight. Gordon Frickers copy is dated 2005. Nelson read widely & kept himself well supplied with books. Nelson’s letters always lacked polish, his English often showed bad grammar & awkward phrases, eccentric spelling. They are though, vigorous, direct & there is rarely danger of mistaking his meaning. Horatio Nelson was said to speak with a strong Norfolk accent. Contemporary evidence to suggest he was actually about 5’6″ & built medium to slim. Horatio Nelson had always said he would rise if possible to the very top of what ever station he entered. John Rathbone took a merchant ship belonging to Hibbert, Purrier & Horton, to the West Indies. The young Nelson made this voyage as a crewman before the mast. The voyage made him a seaman & taught him the ways of ordinary sailors including their distaste for the R.N. (“aft the most honour, forward the better men”). His uncle and guardian Captain Suckling next put young Nelson into small boat work. This was also a reward for attending to his navigation. The boats were a cutter & decked longboat which worked the Medway, Swale & as far afield as the Pool of London & N. Foreland. The intention was to develop his pilotage, decision making, fearlessness of responsibility, both professional & personal. As a part of that scheme, Nelson some how talked his way into becoming one of “the young gentlemen” on the specially adapted HMS Carcass which together with HMS Racehorse made the first voyage of science and discovery by the Royal Navy to the Arctic Ocean. That voyage is the subject of a new book, full of surprises, lavishly illustrated, by Peter Goodwin, “Nelson’s Arctic Voyage”. Nelson clearly had a high opinion of himself yet was obviously a competent officer who managed to tactfully avoid giving his fellows cause to resent him, all necessary qualities in a leader. 21st October 1805 – Nelson died in this rank, aged 47. Son of Edmund & Catherine Nelson, born 29 Sept. 1758, fifth son, sixth child, in the parsonage house of Burnham Thorpe, Norfolk. (Burnham means “homestead by a stream”). Father a rector, Mothers maiden name was Suckling. Her grandmother was eldest sister of Sir Horace Walpole, who had been 20 years a prime minister. Sir Robert’s second brother had been named Horatio & his son was called Horace, that being the more common form of the name hence Nelson’s fore names. 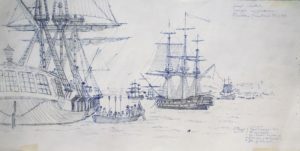 At the end of the Minerve cruise Nelson rejoined HMS Captain and in the immediately following action, the Battle of Cape St Vincent, earned a place in the ranks with Drake, Blake, Anson, Cook, Howe, Jervis and others of the most renowned British sea men. Horatio Nelson was destined to eclipse them all. A featured artist on the Winsor and Newton website. The only artist member of the British Marine Federation, SuperyachtUK and the Marine Trade Federation.